Ethiopia’s government doesn’t want Ethiopia to be thought of as a donkey country. Donkeys have a reputation there as the lowliest of animals and of being unclean to boot. Yet Ethiopia has the world’s largest population of donkeys. It has 7 million of the animals — outstripping the No. 2 donkey country, China, by about a million. And life can be pretty tough for a hard-working Ethiopian donkey. On a recent trip to Ethiopia, I saw one donkey straining mightily while pulling a cart. Overloaded with rows of water jugs and people, the cart weighed hundreds of pounds. The animal’s head was bowed. His thin, shaking legs looked ready to break as he fought for footing on the muddy, rutted road. 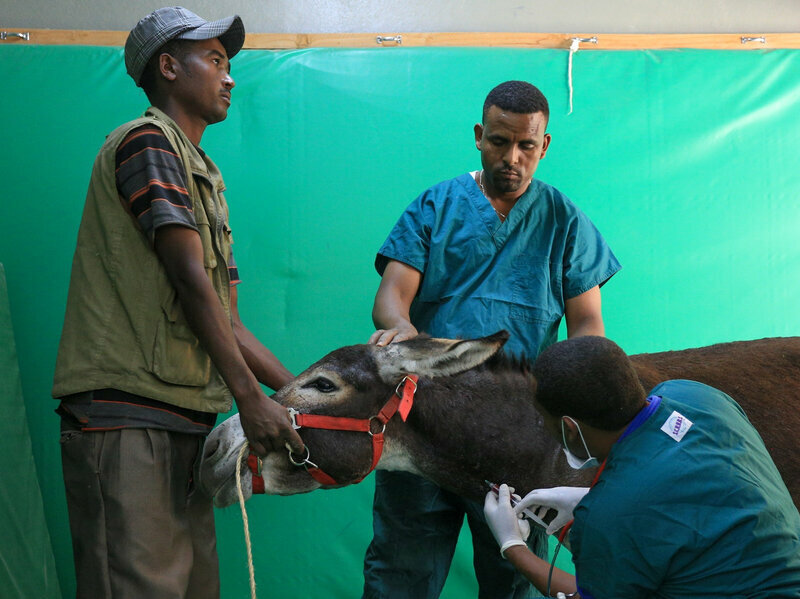 Veterinarians treat a patient at a donkey clinic in Addis Ababa, Ethiopia. 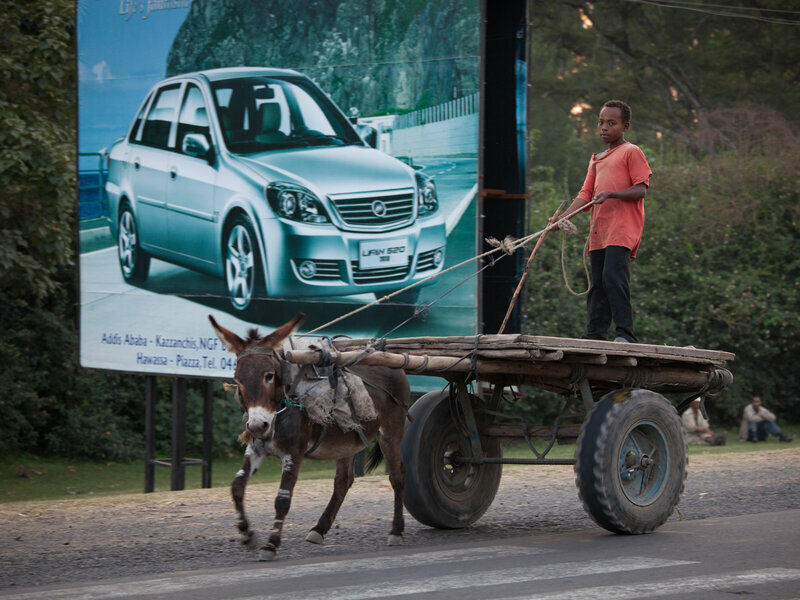 In Ethiopia, it’s common to see donkeys laboriously hauling loads as drivers, many of them children, crack whips or switches across their backs and faces. People depend on these animals to transport water, wood for cooking, food and other goods, as well as people. About 80 percent of Ethiopia’s population of 93 million depend on donkeys in some way, according to The Donkey Sanctuary, a U.K. nonprofit. Donkeys in Ethiopia are often overworked, neglected and abused. In spite of their importance in Ethiopia, these beasts of burden are overworked, neglected, abused and stigmatized. They suffer from harness sores, maggot wounds, infections and colic from poor food, among other ailments. Because people don’t think much of donkeys, they usually do not take them to the veterinarian if their animal gets sick or is injured. Until recently, veterinary colleges didn’t even train students to treat them. If donkeys were sick or too old to work, they were abandoned or left to hyenas — a painful death. But that is changing through the work of The Donkey Sanctuary, which operates in countries with large donkey populations like Egypt, India, Mexico and Kenya. Since 1994, The Donkey Sanctuary has educated Ethiopians about proper care for donkeys, raised awareness about animal welfare with farmers and schoolchildren, and strengthened government livestock and animal welfare policies and training at veterinary colleges. In 2015, veterinarians treated 185,000 donkeys; since 1995, The Donkey Sanctuary has treated more than 2 million total. It also runs several free veterinary clinics, like one in the capital Addis Ababa, at Merkato, one of the largest outdoor markets in Africa. Some 3,000 donkeys work at the market, mostly carrying grain from mills. One Saturday morning, three gray donkeys plodded into The Donkey Sanctuary’s Merkato clinic, where “patients” are examined in corrals. 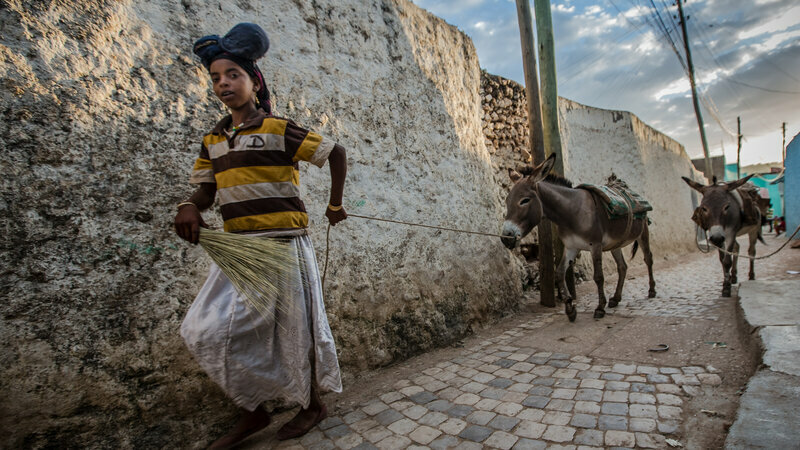 A girl with her donkeys in the streets of Harar, Ethiopia. Owner Gosaye Assef, 28, brought the trio to drink from the clinic’s water troughs. Assef earns a few dollars a day by using his donkeys to transport grain from Merkato’s mills to markets. “I use donkeys to feed myself and my family. Using donkeys is my life,” he says. Before he was trained by The Donkey Sanctuary’s staff in Merkato, Assef didn’t give his donkeys water. Now he lets them drink several times a day. He gives them animal feed rather than letting them forage through trash. And he seeks treatment when the donkeys suffer from hoof problems, step on nails, eat stones or bite each other. The Donkey Sanctuary also showed him how to make better pack saddles and harnesses using heavy fabric and rope to prevent sores. Because many donkey owners have low literacy and can’t necessarily read brochures and fliers, The Donkey Sanctuary gives demonstrations of improved pack saddles and holds awareness-building workshops with communities. It has also started animal welfare clubs in schools to change attitudes at a young age. In the noisy, bustling lanes of Merkato, donkeys silently wait as mill workers strap 150-plus-pound sacks of hot grain onto their backs. One sign that they may be valued more is the going price of a donkey. A donkey now sells for $90 to $150, up from $13 to $22 a decade ago. 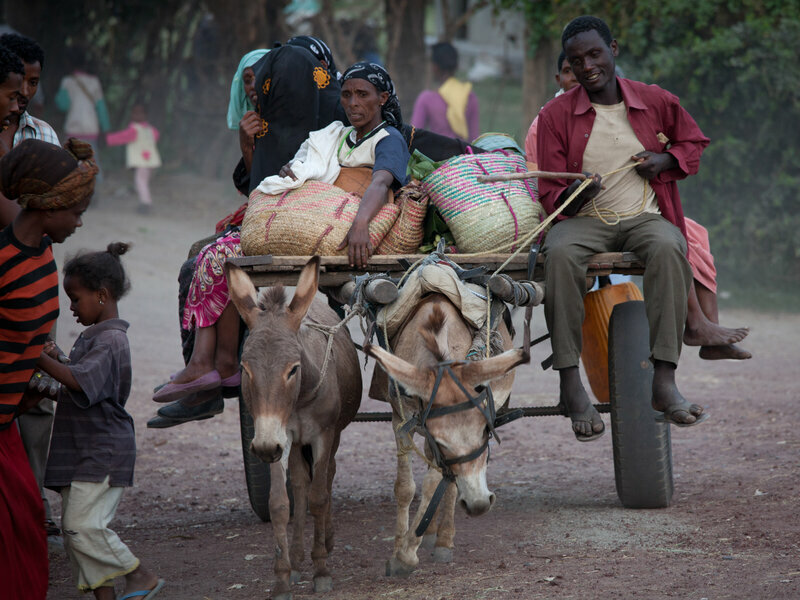 Ethiopians depend on donkeys to transport water, wood for cooking, food and other goods, as well as people. The Donkey Sanctuary works in four areas of Ethiopia and helps about 223,000 donkeys each year. That’s just a drop in the bucket in a country with millions of donkeys. Yet efforts are helping some donkeys and their owners. In Merkato, owner Getachew Mokonin, 35, sits as his donkeys munch from sacks of grain. These animals are solidly built, have shiny coats and don’t shy away when people approach. “All these things [showing] social interaction with owner is good,” says veterinarian Assefa. His donkeys don’t mind being stroked on their muzzles. And for a moment, they lift their heads to eagerly eat a special treat of fresh carrots.